The total uptake for the 2017/18 season was 629 (36%). This is a 50% increase in the uptake for last year when 24% of staff received the vaccination. 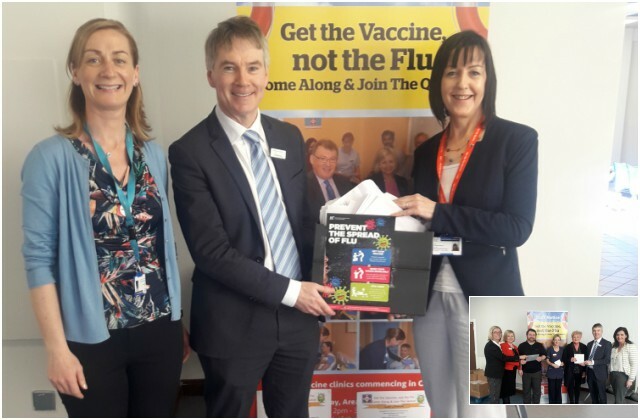 Domhnall McLoughlin, Deputy GM, SUH paid thanks to all those who supported the roll out of the campaign, and especially "I would I like to thank the SUH local committee, my colleagues in Occupational Health, Michael Cannon and Alia Tarabulsi, Peer Vaccinators, Niamh Walsh and Sheila Fowley for facilitating the vaccinations in their areas, Phill Armstrong for securing the prizes and Pamela Normoyle, Saolta Lead, All Clinicians and Managers and staff who promoted and received the vaccine."